Every Friday, we post a special Current Events story that presents a topic that will inspire a lively debate. Use these stories as a springboard for structured debates in your classrooms. Our Current Events on Fridays also include interactive transcripts that can support students in finding evidence to support their claims and defend their reasoning. Of course, discussions and debates like these might become heated. While students should feel free and encouraged to share their views, it’s important to ensure that no one feels threatened or excluded. You might consider modeling how to share an argument in a respectful way, and how to truly listen when peers respond. Reinforce respectful behavior when it happens, and make it clear that there is no place for offensive or mean-spirited attacks. 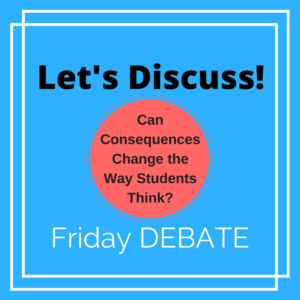 Check out our Debate Current Event every Friday and listen with your students. Share the debate question, and divide students into “pro” and “con” teams. You can choose to assign your students to teams or let them choose sides. We recommend assigning them to ensure that numbers are even. Also, students learn valuable debate skills when they are encouraged to defend an idea they would not have chosen to defend! Give each team an opportunity to brainstorm and research supporting ideas. During this time, teams should listen to the Listenwise story again with their debate stance in mind. If they have access to tablets or laptops, they can research other relevant current events or ideas. Together, teammates should list, group, and organize at least three main arguments. Give each team a few minutes to present opening statements of their position. Then, allow teams to present individual arguments one at a time, leaving opportunities for brief rebuttals in between. Conclude the debate with closing statements that summarize main ideas. Teams should remember that the strongest arguments are backed by evidence – from the Listenwise story and other reputable sources. Encouraging students to defend ideas with evidence fulfills the Common Core ELA Speaking and Listening Standard 1A while pushing them to question and respond to a range of perspectives fulfills the Common Core ELA Speaking and Listening Standard 1C. Students should come together to discuss how they feel about the issues after the debate. You might use this opportunity to discuss which arguments seemed strongest and why. Make the conversation personal and meaningful: How does this topic impact our own lives and our communities? How can we come to a resolution together? If you feel it’s appropriate, you can score the debate, rewarding points for arguments that are clearly stated and well-defended. Having students participate in the evaluation of a speaker’s point of view and reasoning, along with the use of evidence helps meet the Common Core ELA Speaking and Listening Standard 3. You could also use a rubric to reflect on the debate, such as the ReadWriteThink rubric from the International Literacy Association and NCTE. We hope the debate stories spark important conversations in your classroom. Share your experiences with us and the rest of the Listenwise community!